If you’re looking for a treatment for aging skin, hyper pigmentation, or sun damage, we have the cutting-edge treatment for laser skin resurfacing in Toronto. 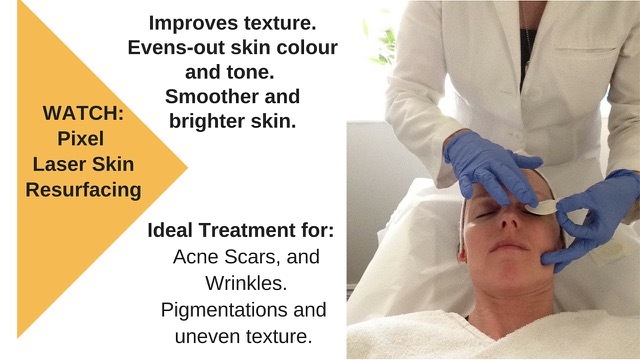 A specialized laser skin rejuvenation treatment that dramatically reduces the signs of aging, Pixel treats the appearance of pores, fine lines, pigmentation and sun damage. Pixel is Health Canada and FDA Approved. Pixel Fractional Resurfacing is based on the principle of micro thermal treatment zones. The laser pulses create tiny holes in the skin, removing a thin portion of the epidermis and upper dermis. This laser skin treatment for Toronto clients then triggers the body’s natural healing process: stimulating the growth of new, healthy skin tissues from the edges of the microscopic holes. The Pixel treats small zones of the skin, leaving surrounding tissue untouched and intact. The end result: new, healthier, smoother tissues in place of any skin imperfections. What Is the Pixel Treatment Like? There is minimal discomfort with Pixel and some sensitive individuals will be offered a topical anesthetic cream to mitigate any potential unpleasantness. However, the majority of patients do not require anything. This treatment does have some downtime associated with it – depending on the specific condition being treated, it can take some clients anywhere from 5-7 days to fully heal. Some redness usually appears immediately following the procedure and then subsides within a few hours. The treated skin will begin to settle down within a couple of days and when redness subsides, the client will experience “micro-peeling.” Skin will soon feel significantly smoother and will steadily improve over the next few months. As with all laser treatments, it is important to use a broad spectrum SPF 30+ sunscreen every day to prevent new damage from occurring. During your consultation you will be advised on how to start a suitable skin care regime for your specific skin type. It’s important that you support your laser skin treatment at Toronto’s Clarity Medspa with the proper products; many store-bought creams, “lotions and potions” are too harsh for skin, especially after your skin rejuvenation in Toronto. Generally, treatment involves three to six sessions at three-week intervals. Pixel is often bundled with other light-based therapies to achieve optimum results including: IPL Photo Facial Rejuvenation, Exilis™, Thermage, and other skin tightening procedures. Call Clarity Medspa today to book your free consultation with one of our physicians: (416) 960-2222.